For her very last state dinner at the White House, Michelle Obama showed us all—her guests, the fashion community, and the world—how to gracefully and powerfully make an exit. And as with many memorable moments during the Obamas’ time in office, she made a statement through her clothing. FLOTUS was decked out in an Atelier Versace gown with a gathered waistline and a slightly off-the-shoulder silhouette. The color: a bright yet soft rose gold that, alone, stands out in a crowd, but when you’re the evening’s distinguished host, it’s a total show-stealer. Make no mistake, however, as gorgeous as our first lady looked, her sartorial choices over the last eight years have never seemed coincidental. They are thoughtful, creative, and sometimes even symbolic of her position of leadership. Unlike so many American designers Michelle has championed, such as Jason Wu, Brandon Maxwell, Tracy Reese, or J.Crew, tonight’s Versace label might even be seen as a nod to the event’s honored guests: the Italian prime minister and his wife. But more so, at this final state dinner, the last before a new president is sworn in, could Obama even be suggesting that nothing (rose) gold can stay? We’ll let you be the judge. Scroll down for the complete look. 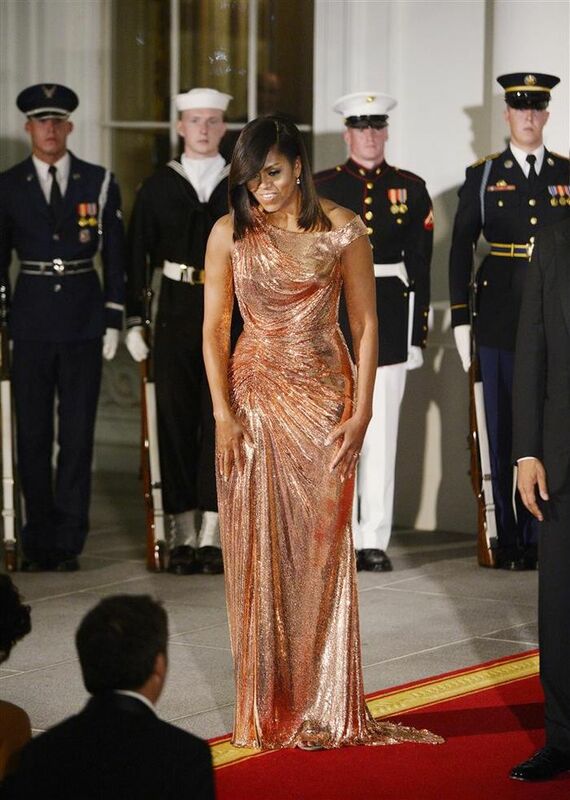 On Michelle Obama: Atelier Versace gown. Shop more fashion editor–approved dresses that stun.